The club Grand Prix series is an internal club competition which is designed to encourage members to take part in races and represent their club and also to reward good performance. There is a separate Grand Prix Series for the ladies and the men. A series of races are selected each year and points are awarded based on where you finish in each race: The first Harrier across the finish line is awarded 50 points, the second Harrier gets 47 points, the third Harriers receives 45 points and then points decrease by 1 for each Harrier after that (fourth gets 44 points, fifth gets 43 points, sixth gets 42 points etc). For the 2019 Grand Prix Series there are a total of 15 selected races plus your best parkrun time of the year. Out of these 16 results, your best 10 scores will count towards your final score. Your parkrun times should be picked up automatically at the end of each month (as long as you have Huncote Harriers attached to your parkrun profile). Click HERE to open our Results Database. The current Grand Prix Series standings can be viewed by selecting ‘Grand Prix Series’ from the menu options. The series runs right up until the last parkrun of the year in December. In order to be eligible for any Grand Prix prizes you must be a fully paid up member of Huncote Harriers at the end of the year when all of the scores are finalised. 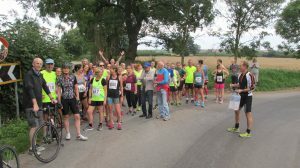 Please note: the Joy Cann 5 and the Huncote Hash are not in the Grand Prix Series as our primary task and responsibility is to arrange and manage the Best Summer League and winter cross country races in the county!